Board game night can now be all about this Friends Monopoly game. We all know the Friends TV series and the Monopoly game and this time they came together. You game pieces are details from the show as there is the guitar of Phoebe, the chef’s hat of Monica and 4 more pieces. 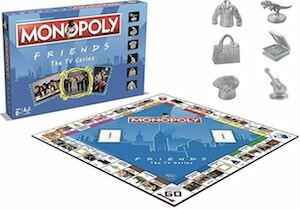 And the game board does not have the normal streets we know from the classic Monopoly game but they seem to be all episodes of Friends and there are different stops to like Central Perk Tab and Apartment 20. Everything is different compared to the normal Monopoly but it still clearly is Monopoly but then all styled around Friends.